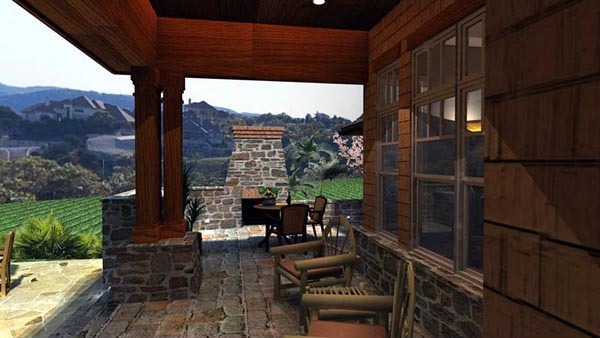 Houzz 225 of our visitors have told a friend about this plan. Take a great plan and add a new look and a media room, updated for Life in the new millennium. 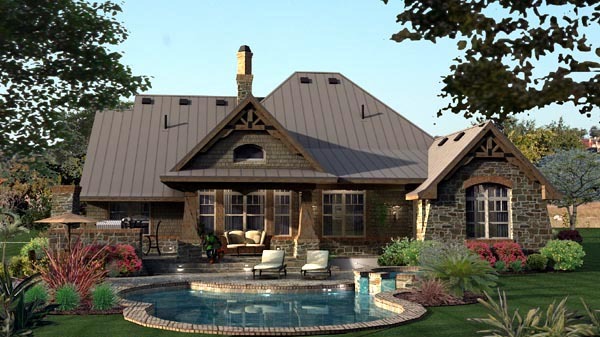 This plan has the warmth and comfort of a home you'll want to spend a lot of time in. Appointed with a maximum of amenities on the inside from a Gourmet Kitchen to a Formal Dining and two sided fireplace to the outdoor living areas, and BBQ porch.. You'll love entertaining in this fabulous home as well. Question: Is there a three car option, and would that then increase the bonus area? Question: What is the material on the areas of exterior that are absent of rock? Could that material easily be substituted with brick? If so, is there adequate support to use brick on the areas above the roof line? Answer: We show a wainscot of stone/masonry all the way around this home. The higher portion of the wall is siding/shingle which is easily replaced with masonry/brick as there is already a masonry ledge. The portions above the eave lines can potentially be masonry too, but would need additional support in the way of steel angles and columns. Question: I won't be ready to build for another 1-2 yrs. However, I already own a fully wooded lot. I am trying to plan for clearing the lot. Would it be possible for me to get more detailed external dimensions of this plan with the 3-car option? I want to be able to lay it out in a CAD tool. Answer: Without purchasing the plans, at least a bid set, the only info we can make available to you is the overall dimensions which are 86’-2” x 73’-10”. We do have CAD files available for purchase as well. If you have a tree survey in CAD, you can send that to us and we can put the house on your survey. Question: what is the width of this house with 3 car garage? Question: Do you have any renderings that would show what the shower in the master bath would look like? Question: Is the special woodwork designs in the gables included as a pattern to create? Answer: Yes, there is a truss detail. Question: How many linear feet of usable counter and cabinets are in the kitchen once you remove the appliances and sink? Thanks! Answer: There is 18.5’ of useable counter top in the kitchen. Question: What are the dimensions of the front door? Answer: It is oversized at 4’x8’. Answer: Yes, just request it when ordering. Question: can I remove the fireplace and all those posts / walls enclosing the dining room? Answer: Its possible but would take some large glulam beams in the ceiling. Question: -what roof is displayed in photo? -what is the garage ceiling height? 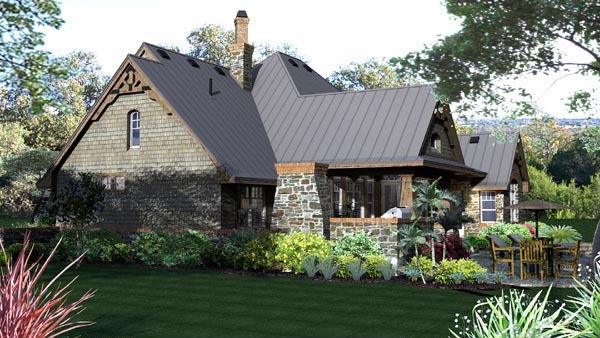 Answer: Garage is 8’ tall and I believe our rendering shows a metal roof. Question: if I get the 3 car garage version of this plan, will it have the same bonus area as plan 65869 above the garage? Answer: It has more actually. The Bonus “T”’s out over the 3rd bay and additional 12’ deep x 12’ wide. Question: I'm considering buying this plan but I need to know the linear footage of the basement walls. I'm trying to get a round about quote from my local basement guy before I move forward. Answer: Just the perimeter of the basement is 242 LF. Does not include stem walls at porches or garage. Question: My question was with respect to outside dimensions of house (not individual rooms). 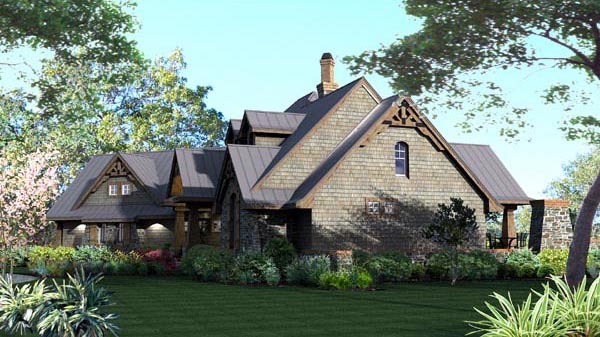 The house plan is not rectangular, so its not clear what the total width/depth lengths relate to. Need outside dimensions to determine if plan will fit on a particular lot. 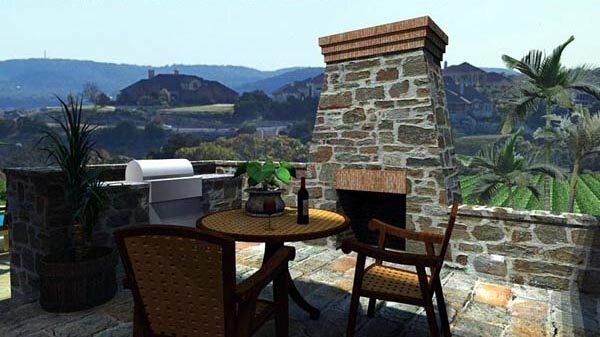 Answer: Overall dimensions (width) are from the front left corner of the garage(edge of masonry/slab) to the right edge of slab(does not include outdoor fireplace projection). Depth is from front right corner of garage to back of master(edge of slab/masonry). Question: how are you measuring width and depth? Answer: If you’re talking about room sizes it is left to right(width) x back to front (depth) inside of stud to inside of stud. Answer: Its just a low wall, more of a fence/extension – totally optionally. This was part of a previous version of this plan that had a trellis sitting on that wall. Question: Do you have any actual pictures of this house? Question: Hey!! 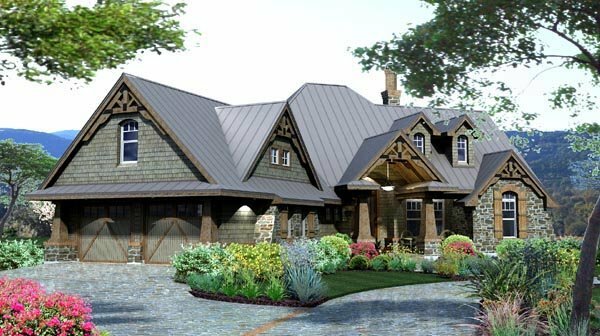 I love this house plan!! I was wondering if you could email me a picture of the home with shingles on it instead of tin! Also me and my husband wanted to keep the rock where there were at and put vinyl siding (shakes)on the rest of the home. and we would like to stay with the same colors that are on the home now!! Thank you so much!!! Just hoping to get a better view of what it will look like with our changes!!! Answer: Sherwin-Williams has a routine on the website called “Visualize it” which can perform this function for you. Question: Want to order this plan with a 3-car garage but do not want to change the layout of the interior of the house and do not want to add any additional heated space! Want to setback the third garage about 3 feet as it is for motorcycles! Also, we do not like the dormers on the front of the house! Are they just for looks or part of the roof rafter system? Answer: 3 car version is available for $150 with no changes to the interior, the garage is offset 2’ shorter in depth on the back alongside the other two. You can eliminate the dormers, they are just decorative. Question: Saw the dormers in the attic, could this be useable space, acsesseed through the bonus room. Answer: Its possible, but we have not designed that space for that purpose yet. Question: Is there a similar plan that has approximately 2500 square feet on the main level? Question: What are the dimensions of the shower in the master bath? Question: Customer wants to know if the exterior wall material is stone. If so, what color of stone is it? Answer: It is stone. Stone doesn’t come with color designations like paint. You just have to find it from a stone quarry. 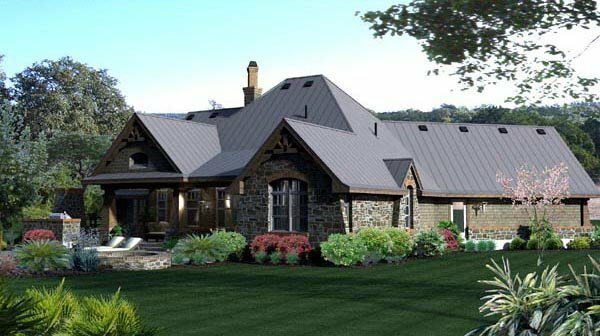 Question: How much does the metal roof add to the cost? 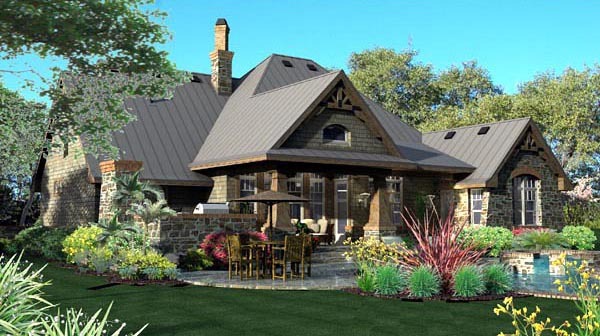 Answer: Roofing is a small percentage of a home’s total cost. 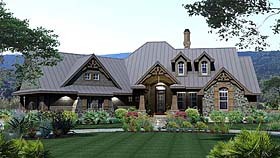 Composition shingles can run anywhere from $40 –$100/square(100 square feet of roof surface), metal roofing can be as high as $250/square. This home has, I’m guessing, 35-40 squares. So the difference in cost would be in the range of $5 – 6,000.00 give or take. Question: The pictures for this plan are very nice on line. Do you have any of the rest of the house? Bedrooms, bathrooms, etc. Question: Do you have any additional photos or real photos of this plan in place. From viewing the photos that I am able to open on your site, the rooms appear smaller than the dimensions. I hope you are able to get the other photos to open on your site. I like this plan but wish the laundry room larger like an additonal room connecting from garage to master closet and leaving the existing laundry room as a hallway/mudroom/drop zone. Question: What is the estimated cost and sq ft of a finished basement for this plan? What is the cost estimate of the pool dipicted in this plan? Question: Is the circle in the closet in the garage a hot water heater or a sink? what is the total square foot under roof? Answer: That is a water heater closet. The total covered area is 3502 SF which does include 395 SF of Bonus area - depending on whether you use that space or not. 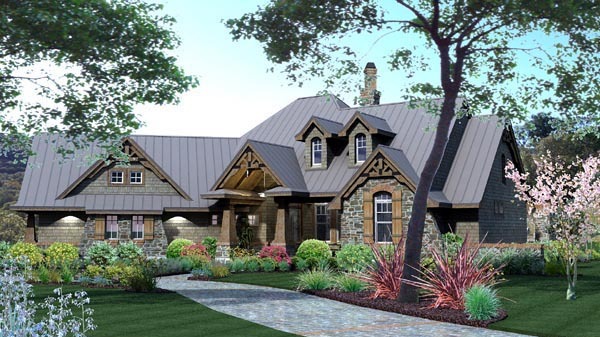 Question: Are the Dormers on the front real or fake? ie; do they let light in to the house or not? Answer: They only provide natural light in the attic. Could be used for additional bonus space though. Click Here to download a free PDF Brouchure of Plan Number 65871. Master Ste 9' vaulted to 11'-8"
BR2 9' vaulted to 12'-0"